Published at 24/01/2015 20:53:23 from Argentina, 14811 visits. 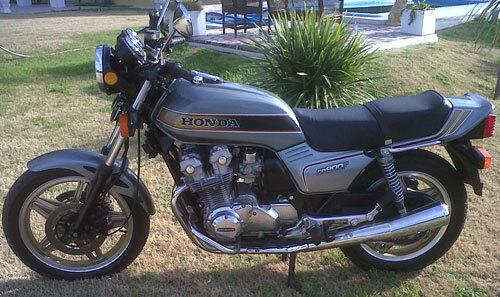 Honda CB 900 F motorcycle model 1981. I think one of the best in the country, State of collection, no blows or falls, with its factory in their case tools, the two original keys. Holder. Ready to transfer documentation to the day. Covered ambbas new and balanced. New original yuasa battery. New brake pads "EBC U.S.A." on three discs. Oils and new filters. Carburized with gauges. The bike is ready to travel and enjoy without having to spend her money. Always used it great people without abuse. His walk is to admire since it behaves excellently well both in route and city, there are many of this colour, with Golden rims which are maintained to this day without a single mark or rayon and making very fine and cute to the bike. Try to get all possible photos closely so appreciate your state. The bike is used only on weekends, never flat water or soil and is saved and plugged in my garage. He would only accept only moto BMW GS 650 in good condition and the difference to agree.